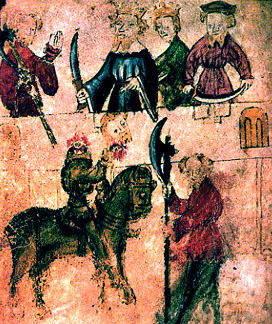 Here, in an illustration made about 1400 CE, Gawain beheads the Green Knight, who survives this. Sir Gawain and the Green Knight was written by the Pearl Poet, and Sir Gawain’s horse is called Gringalet. The story begins at King Arthur’s court, but there is a kind of preface setting it into the context of the Trojan War and its aftermath. This is that beginning, in modern English since I do not read Middle English easily. We are to notice the bob and wheel construction. Have come about through sin. Today we are having a yoga class. In this class we will imagine how it would be to go through the days without guilt. I think it would be amazing. I shall not list here the things I feel guilty about. But as I think of them and imagine them leaving me, I become aware of their weight.